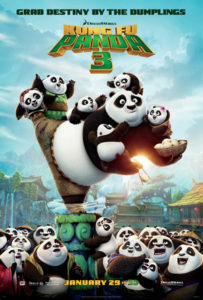 A pretty fun movie, this one has the story of Po finding his long lost father, meeting and training a village, and also a villain who turns kung fu masters into jade zombies, so yeah, it’s pretty packed. A worthy and enjoyable sequel, this movie does what the second movie couldn’t. It gives us a cool and unique villain. The second film was a fine entry, but it was missing a few things. The storyline there was just okay, and the villain was lacking. In this third film of the trilogy, both of those elements are put back in place. The villain here is Kai, a blade wielding Ox warrior who has been banished to the spirit realm. Only he finds a way to come back and turn former Kung Fu masters into jade zombies. Then he comes for Po, who is dealing with a story of his own, involving the reuniting with his long lost father. Po goes to the father’s panda village to train for Kai, and we end up with a pretty engaging story. The village training stuff is kind of cliched, but otherwise, this is a pretty good film. Kung Fu Panda 3 is pretty good. In fact, the entire trilogy has been good, which is more than you can say about most animated trilogies (Shrek, Ice Age, to name a few.) This is right up there with Toy Story as one of the best animated trilogies around, and that’s in large part due to the comedy. The first movie was exceptional. Jack Black nailed the party perfectly, and it had a great story with fantastic animated action scenes. The second film wasn’t quite as good. It was the weakest of the three. The action was there, but the story was just okay. But now, with this third film, the series is back. Sure it doesn’t rival the original movie, but the story is right there where it should be, supplying answers to questions we have been wondering throughout the duration of the three movies, and taking the plot in some new directions. The second movie ended with Po, the Panda, conquering his enemy, and then off in the distance somewhere, we saw a village of Pandas and one Panda in particular who stood up, as if he was Po’s father. This was a cliffhanger of sorts and setup for another film. Kung Fu Panda 3 is that follow up film, and it is indeed about the village of pandas and Po going to join them. The way that the second movie ended and led to the third one was actually perfect, because it in no way took away from the storyline of the second movie, in order to reach that point, (like say, the end of the second Matrix movie, which was all about leading into a third film, or the end of The Amazing Spider Man, which introduced the prospects of lots of different villains.) What the Kung Fu Panda movies did was much smarter. And in the third movie, we get a fantastically cool villain. Kai, a the bull who lives in the spirit realm, and carries green blades which he swings around on metal chains, is a lot of fun. He’s voiced by JK Simmons, a man who has a voice that was just made for something like this. In the first film it was Ian McShane playing the villain, Tai Lung, and he was pretty awesome and menacing. Then the second movie gave us Gary Oldman, a man who used to be a great villain actor, (The Professional,) but who in more recent years has gotten pretty old and tiresome. Just recently Oldman played the villain in The Hitman’s Bodyguard, and it was a poor take on what Oldman once did as the villain in Air Force One. All this not to mention his villainous takes in The Fifth Element and True Romance. But Simmons is not someone who commonly plays a villain, (although he sure did in Whiplash, which he won an Oscar for,) and the change is definitely good for him. He fits the role perfectly and really commands our attention here. Kai breaks loose from the spirit world at the start of the film. He used to be friend with Oogway, the turtle spirit who trained Master Shifu, (the mouse Sensei who trained Po and the other animal warriors in the group.) 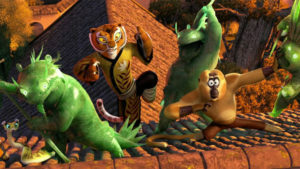 Kai fights Uguay in the spirit world to kick start the film, and it’s a very cool fight with Kai slamming his green blades through giant rocks and Oogway creating Chinese characters (letters and words,) and shooting them at him. In the end, Kai wins the fight and breaks free to the real world, where he starts going after sKung Fu masters and turning them all into jade zombies. They look and sound like jade and porcelain ceramic statues, and it’s a very cool effect. Po, meanwhile, is learning to be a teacher and take over for Shifu with training the others. He’s not very good at it, and the animals in the group, (Tigris, Monkey, Mantis, and Crane,) get hurt while following his instructions. Po retires to the noodle shop where his dad, a duck, works, and discovers that someone there is beating his dumpling eating record. It’s another panda, named Li, who is even bigger than he is. Po approaches this panda, and the two of them converse about how the Panda is looking for his missing son and Po is looking for his missing father. The two don’t realize that the two problems are connected for a while, and it’s pretty funny. But eventually they get it and the reunion begins. There are some fun scenes of them messing around with sacred artifacts, showing a careless that is clearly a like father-like son situation. But pretty soon things get serious when the group of animal warriors is attacked by jade zombie versions of old masters that they have studied about. There’s a rooftop fight between them which is pretty fun, with Po thrilled that he is meeting these masters and seeing their signature moves, even if the moves are being done to him. When the fighting settles down, the voice of Kai comes out of the jade zombies, which confuses the animal warriors at first. But eventually learn that Kai is going through the land turning all Kung Fu masters into zombies, and they are next. In the village, Po meets lots of other pandas and learns their ways. The pandas are very zen. They don’t walk or run from place to place, but instead they roll, and they roll where the ground takes them, giving up control to the earth. And while Po is learning the ways of the pandas, including playing hack-i-sack, back home, his friends are under attack. Mantis and Crane in particular, go out looking for Kai, and don’t exactly fare well when they find what they’re looking for. When Po learns that Kai and his army of jade zombie soldiers is headed his way, he starts training the village. This is very much like The Seven Samurai, or The Magnificent Seven, or The Three Amigos Po teaches the pandas how to use what they’re good at for fighting. So the dancing female panda who spins around with streamers moving through the air, for example, is now given nunchucks in place of streamers. Instead of a bouncing toy that the kids are playing hack-i-sack with, they now start playing it with dumplings, firing them into the air like snowballs. The village training idea is kind of cliched, but it’s the first weak part of the movie. Between the cool villain and then story which really covers a lot of ground, what he get here is a pretty solid movie. In general, when a sequel tries to build onto an original film by introducing a character’s parents, it’s usually a recipe for disaster. That’s because it just feels forced and tiring. Looks at Daddy’s Home 2 or A Bad Mom’s Christmas. But here, in this animated animal kung fu movie, it actually works. That’s because the movie doesn’t revolve around the father-son story, but uses it to further the story of this new villain who needs to be taken out. The two storylines, about Kai and about the panda village, meld together nicely and we get a pretty good movie as a result.